The Strand Theatre’s status as a vibrant home for the city’s performing arts was once again in the spotlight this past weekend, thanks to the Boston Arts Academy. The students from BAA produced three performances of “The Wiz” on the Strand’s proscenium stage on Friday and Saturday, and they not only delivered electrifying performances, but they also showed us how valuable the city-owned theatre in the heart of Uphams Corner has been— and can continue to be— if we invest in the venue and our young people. This marked the second time that Boston Arts Academy — the city’s only public high school for the visual and performing arts— staged a musical at the Strand. In 2015, the students produced “In the Heights,” and it was also a big success. Saturday night’s finale of “The Wiz” took the school’s ambitions to the next level, says Ann Clark, BAA’s headmaster. The BAA follows something of an apprentice model, with students matched one-on-one with instructors. The students did everything last weekend. They sang and danced and acted on a stage that included a creative set design built by student carpenters; the school’s band filled the orchestra pit and played the legendary score of “The Wiz” to perfection; a chorus of singers accompanied the cast from one of the balcony boxes; and the all-student crew worked the spotlights, sold tickets and refreshments, and ushered guests to their seats. Just feet below, in the pit, the Tyrone Sutton-led orchestra was masterful throughout the two-hour performance. Drummer Mercedes (Dominic) Glaude drove the action and wowed the Strand audience with beats straight out of an Isaac Hayes record. More than 100 students are listed in the cast and production notes— a testament to the team effort that made “The Wiz” such a fabulous success. The Strand is a city-owned asset, the only one of its kind in Boston. It’s also the key to making Uphams Corner and greater Dorchester a destination for people from across the city— and beyond— to enjoy the arts. We would like to see the Strand continue to be the incubator for young talent in our neighborhoods, as it has been for decades now. Last weekend, BET aired a terrific three-part mini-series that chronicled the history of New Edition, one of Boston’s most acclaimed and well-loved bands. They got their first big break by winning a talent show at the Strand. 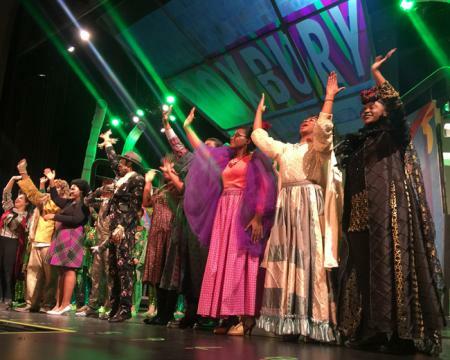 More than 3,000 people watched the BAA’s “The Wiz” over three shows. That’s a huge victory for the school and for the theatre. The city’s larger arts community— along with political and business partners who helped make last weekend’s BAA production possible— should discuss ways to build on the momentum of “The Wiz” weekend at the Strand.